Population health management is the collection of patient data from disparate health information systems into one place. In healthcare data analytics, managing both patient bases, as well as the companies that manage them, are both integral parts of a well-working machine. The goal of population health analytics is to optimize the outcomes of an overall or specific population of patients while minimizing costs for the business entity. Business analytics in population health management provide the insights necessary to track healthcare KPIs within the organization while highlighting information about clients and populations that promote better understanding and treatment measures by the organization including identifying risk stratification, patient engagement, and identification of correct treatments and facilities. Integrating all this information into one record allows for insights to be extracted that promote better diagnostic and treatment systems that lead to better overall patient outcomes. It helps answer important questions like: how to improve outcomes for single patients or populations, what should be done to provide optimal care from the standpoint of the organization or clinician, how are those within the organization performing, and how does the organization update and transform in order to make and deploy improvements? When looking at patient data information relating to care and outcomes, the information can be complex, and not always viewed as part of a whole or bigger picture. It can come from many sources that measure differently, have different parameters or definitions for measurement, and have different locations or programs for storage. The ability to streamline how this information is used and stored, and to create big enough datasets to extract actionable insights and view patterns and anomalies, allows a facility to improve their overall performance and preventatively deal with patient problems. A good BI solution will easily help an entity to visualize their client base, and employee performance, in order to attain more meaningful results. This will also lead to better patient and business outcomes. When looking for a good BI solution in population health analytics, there are important things to consider. It needs to be able to combine disparate data sources to create one universal truth, have the ability to refresh at regular intervals (hourly, daily etc.) to stay up-to-date, and the ability to drill down, and be queried and manipulated, to extract granular data. Reports that take weeks to create off of lacking software, or by overworked IT departments, can result in untimely, and therefore, irrelevant insights. The ability to query, manipulate, and drill down on specific data points in an environment that is visual and clear, means a greater ability to determine what is going on beyond the obvious, and to draw connections that might not otherwise be clear. Another important thing to consider is the safety of sensitive patient data. Dealing with large amounts of personal patient health information requires a system that is extremely secure. Sisense developed its product with all the above issues in consideration. It can handle and consolidate large and disparate datasets, and it does so in the cloud meaning no new hardware or supplementary warehousing is necessary. This means ultimate flexibility and no limits to scalability, all while preserving data and all details within. 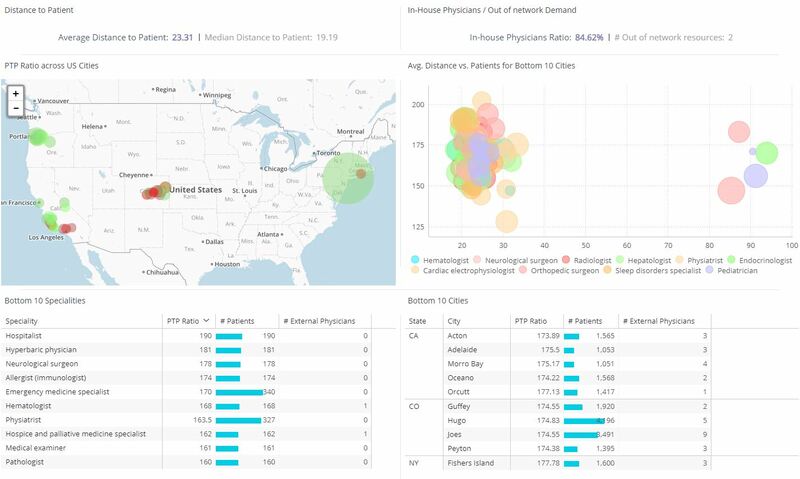 The hybrid model of Sisense shows the complete picture of population health management with the ability to build Live Data Models in both SQL Server and Amazon Redshift, and show it alongside historical data models – revealing trends and patterns that are not normally seen in one view or the other. What really sets Sisense apart is the ElastiCube technology which allows even non-IT people the ability to structure, assemble, and adjust their own data. This makes it a product that can be used independently by different departments in an organization, all with the ability to create dashboards, make reports, and derive their own insights self-sufficiently, and in significantly less time, with drilled down granularity intact. Finally, our security is optimum. Having worked already with leading healthcare organizations, Sisense is built to include high-level security to keep all information completely protected.